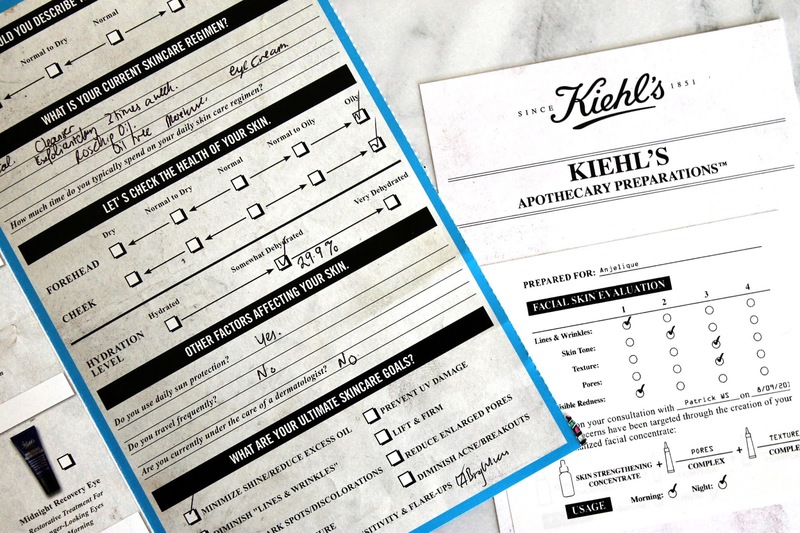 Not only am I obsessed with skincare but I am also a huge fan of the Kiehl's brand, so when I was invited to try their new Apothecary Preparations I jumped at the opportunity. It's a new level of personalised service with tailor-made skincare concentrates that addresses each customer's unique skin concerns. Each customer's personalised Apothecary Preparations facial concentrate is comprised of three distinctive parts: the base, Kiehl's Skin Strengthening Concentrate, plus two individually selected Targeted Complexes which are selected during your consultation and skin diagnosis. During my consultation, my oil and hydration levels were checked and alongside the help of the Skin Atlas we were able to determine which skin concerns were most important to me. There are five Targeted Complexes to choose from which include a Wrinkle Reducing Complex, Texture Refining Complex, Visible Redness Neutralising Complex, Pore Minimising Complex and a Brightening Complex. My personalised facial concentrate included the Pore Minimising and Texture Refining Complexes. Following the consolation, the Skin Strengthening Concentrate and the chosen two Targeted Complexes are then enclosed in a personalised box for the customer who then mixes them at home prior to their first application, for a uniquely potent, tailor-made skincare treatment. Do you think you would try out this service for a serum that is tailor made for you skin? Have you ever tried anything from the Kiehl's brand before? Never tried Keihls even though this was one of the first brands that came under my radar. It's not that I don't want to but I have so many skincare to go through before purchasing any and judging by the rate that I am going? I probably will start trying this brand once I quit blogging. You should definitely give this brand a try Shireen- they have really great targeted products for your skin! Haha yes it is actually so much fun Gabrielle! So worth it even for the consultation! I haven't tried any Kiehls products before but the Midnight Recovery Oil has been on my wishlist for ages! I think this is kinda cool. I'd definitely be up to trying it out, haha. Ooh yes, definitely give that a go! I have just finished a bottle of their Daily Reviving Concentrate and it worked wonders for my skin! Definitely give them a go Cara! I have seen stores of this brand everywhere but never actually got anything. I should try it one day! Camila you need to get down to the shops and try something! I recommend the Daily Reviving Concentrate! Exactly! I loved how tailored it is to your own skin!